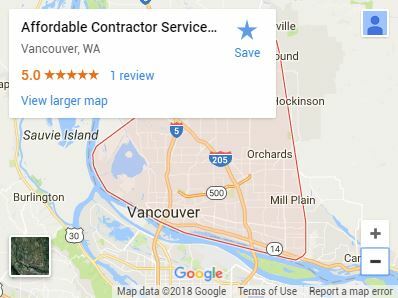 The experienced general contractors and remodelers at Affordable Contractor Services, LLC are known for their ability to handle any job in town. Full construction of home additions, inside and out remodeling, and improved living spaces. Schedule a walkthrough and get your free estimate today. Fences held up by years of experience. Known throughout Vancouver, our fences were what got us started and are still our pride and joy. Install new windows that look as good from inside the house, as they do from out. One of the perks of being a general contractor means we get to keep our options open. Whether it’s a separate garage, interior detailing, or even a brand-new deck, our crew can get it done. We also take on commercial projects including acoustical ceilings and office build-outs. That means if we think we’re a good fit for a project, we’ll take it. If we know someone who can do the job better, we’ll send them your way. Open Communication. We keep you informed every step of the way. Collaborative builds. Our building directive comes from you first. Quality guaranteed. The work we do is backed by a 100% quality guarantee. Most of the work done in the construction or remodeling industries is performed by general contractors like those at Affordable Contractor Services, LLC. We want to take our industry expertise and apply it to your next build and your future remodels. Everybody on our team takes pride in what we put together and are glad to be able to stand behind the work we do for our clients. From a new fence for the backyard, and a set of new windows, to anything in between, our team is always ready to hear your plans and get to work. We work directly with architects and designers to ensure every design element is incorporated into the project. We make all of our estimates in good faith and start every job with a crystal-clear understanding of client expectations and design plans. With nearly twenty years in the business, we know how much a new fence, new windows or any remodeling project can change the entire feel of a house. We hope you’ll give us a call to share your ideas, big or small, and let us be your building solution. Our goal with every job is a perfect end-product and 100% customer satisfaction, everytime. Ready to talk about your plans? Give us a call today.